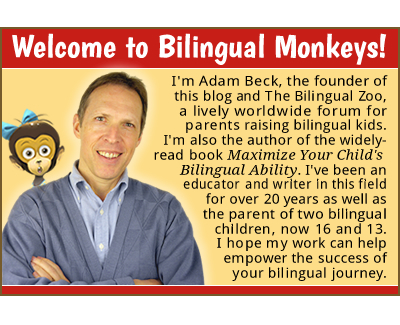 ADAM’S NOTE: Do you have enough resources to regularly engage your children in the minority language through playful games and activities? 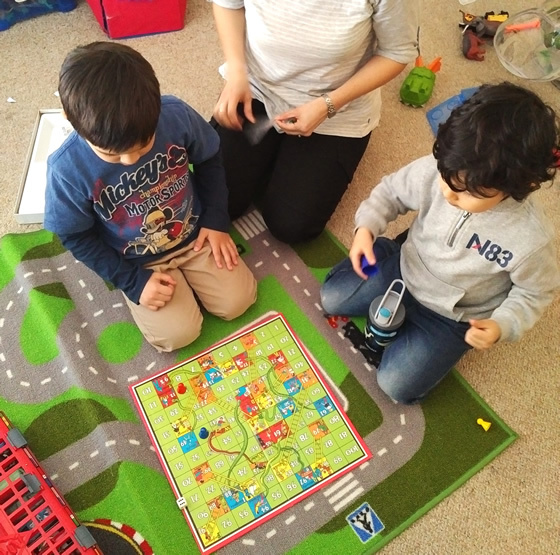 In this motivating guest post, Filipa Pinto describes her personal efforts as a parent and workshop leader of small children and offers useful suggestions for specific games and activities that are both fun and effective for language development. With Christmas approaching, maybe you’ll find a few good gift ideas for your kids! Thanks, Filipa! Filipa’s children, Tiago and Elisa, speak French with their mother and Spanish with their father. They’re also acquiring English from school and the community. Filipa Pinto is a cheerful wife and mother of two beautiful trilingual toddlers (French, Spanish, and English). She was born in Portugal and raised in France. 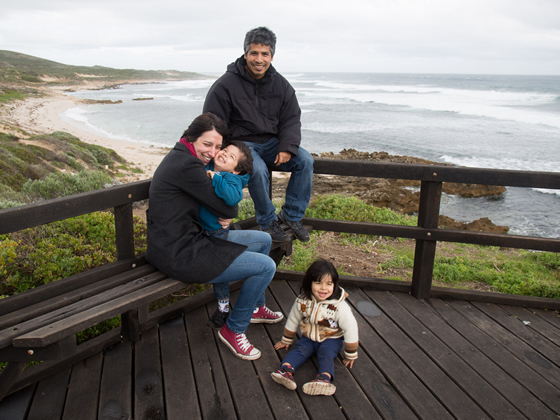 She moved to Perth, Australia to pursue her Masters degree at the university where she met her husband-to-be, who was also an international student. He is from Peru. Filipa is the owner of Le Toboggan, an online bookshop that specializes in international children’s literature. 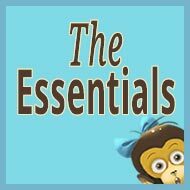 She runs French and Spanish workshops for kids, and is also an international trade consultant. My husband and I use the “one person, one language” method to raise our children. We live in Australia and English is the community language. We never speak English with the children inside or outside our home. I speak French to the children and my husband speaks Spanish to them. Between the two of us, we use Spanish. We’re lucky in a sense because I’m fluent in Spanish and my husband can speak French so we can speak freely to the children without having to translate for each other’s benefit. I’ve been working from home for over a year now and my children, 4 and 2.5, speak excellent French and good Spanish, and their English isn’t too bad considering they go to daycare two days a week, the only time they’re exposed to English without us around. They can understand everything they’re told, but their answers aren’t as elaborate as in their dominant languages. We aren’t worried about their English since they’re going to be schooled here in Australia, but we’re conscious that they might want to drop a language when they start kindergarten and Spanish is the most obvious possibility. They spend more time with me than with their father, hence their stronger ability in French. So I decided to be even more proactive. I now take my son to Spanish workshops that I run for children, and my daughter will join us when she’s older. 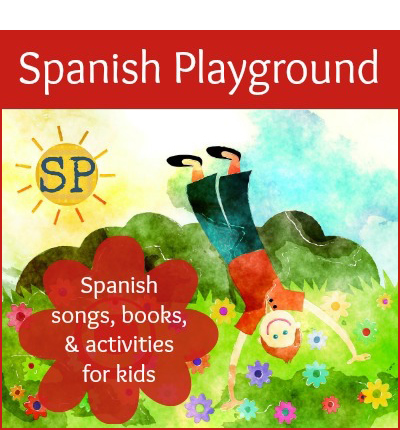 We also attend a Spanish play group once a week. We play all sorts of games, indoors and outdoors. I chose to make these playful times an opportunity to practice their Spanish. We’re having so much fun that they don’t seem to mind! Some days, though, they want me to only speak French and that’s fine; I never force them to speak Spanish with me. Like many siblings, my children are very different in some ways, so I try to use activities that can appeal to them both. For example, my daughter loves coloring in pictures, but my son doesn’t. He prefers painting. So from time to time we paint with our hands and use different kinds of paint brushes on a variety of materials. Games and activities like these are great ways to promote both language development and social skills. Children need to wait their turn and be patient. We also try to have our children take part in as many play dates as possible with children who speak the same languages. 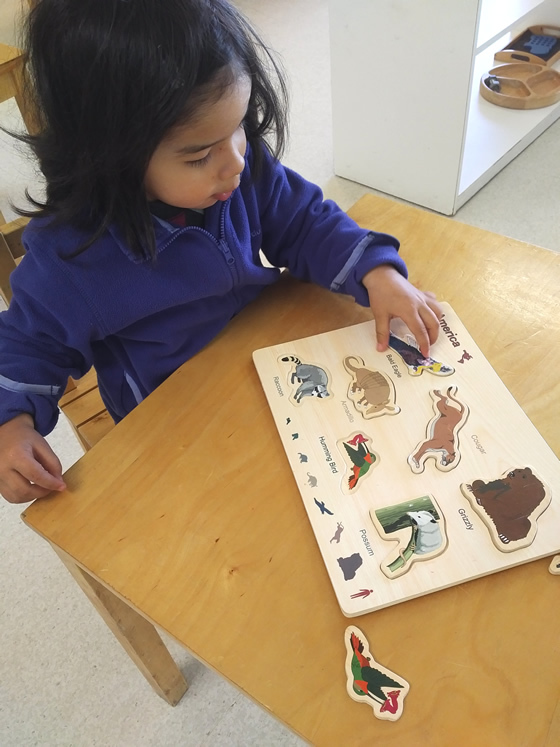 Elisa, at daycare, works on a puzzle, trying to remember the names in English for the words she already knows in French and Spanish. There are, however, a few important tips that can help everyone enjoy this time together. Tip #1: Adapt the games or activities to suit your child’s age, tastes, and ability to focus in order to keep things fun. Tip #2: Come up with new rules so you can encourage children to practice the target language. For example, when playing “Snakes and Ladders,” each time my son would land on a snake’s head, I would ask him something in Spanish. Since his French is advanced for his age, I want to focus on strengthening his Spanish. It could be “What color is this [an object I’m holding]?”; “What do you play with at the park?”; “Can you count to 20?”; etc. Then, if he gives a suitable response, he can stay where he is instead of sliding down to the snake’s tail. Tip #3: If the child is losing focus, it’s fine to end the game early if you’ve already managed to encourage some speaking. Packing up the game before it ends shouldn’t be a concern. Tip #4: Persevere. 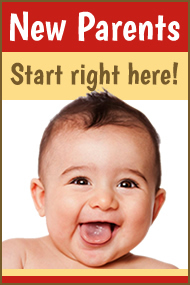 Maybe your child doesn’t want to play or speak in the minority language today. Try again tomorrow. Games, and particularly board games, are great in so many ways. You get to spend quality time with your child and you can also nurture problem-solving skills, logic, and concentration. If your child likes to be outdoors, you could take a board game to the park to play during a quiet moment. Tip #5: Moderate your expectations, as needed. If the child doesn’t want to play in the target language this time, he may be more interested next time. Don’t try forcing the child to speak or you might foster resistance instead. Tip #6: Offer a variety of games. Borrow them from your local library or toy library, or purchase them for your home. Tip #7: Keep your activities playful and fun, and enjoy every minute of your time together. Here are some of the games and activities we play together and the ways we play them. 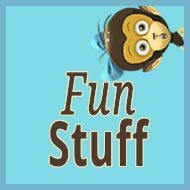 I try to relate our games and activities to either a story we read together or a fun fact. This helps children remember information by making it more relevant to them. Tiago points to the places where family members live on this large puzzle of the world. My son was completing his first puzzles by the age of 14 months. He’s a good observer and has enough patience for this activity. 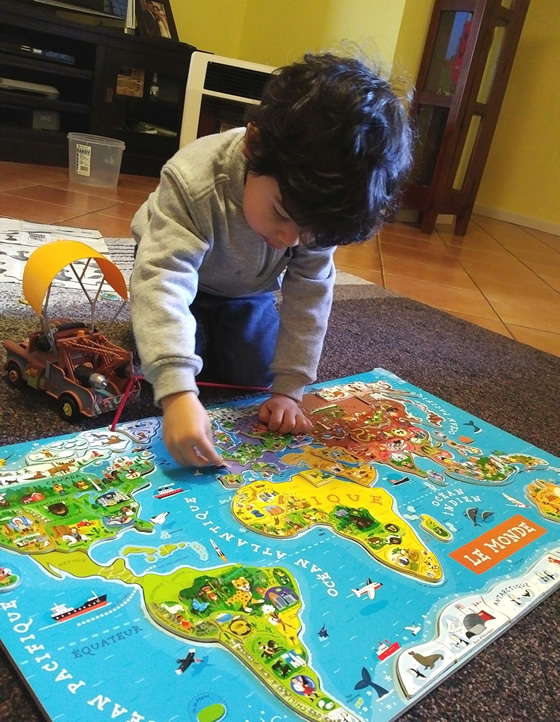 We have over 20 puzzles at home, including wooden puzzles and floor puzzles with the alphabet, numbers, the Australian map, and the world map (his favorite lately). The puzzle of the world map is a French version. The countries are magnets that stick to the board so it can be hung on the wall. This makes it even more appealing. He often plays with this puzzle and, thanks to the books we read and the fun facts we’ve told him, he can now locate Perth, Australia, where we live; Paris and the Eiffel Tower, where my parents live; New York and the Statue of Liberty, where his grandfather used to live; and other special places in the world. He now talks about visiting these places. His favorite book at bedtime has become the World Atlas. He likes it because he can recognize the landmarks from the world puzzle and learn more facts about them. Puzzles are great tools for concentration, fine motor skills, logic and mathematical/space concepts, and matching images. They are usually quite colorful and offer many things to talk about: What is it? Is it an animal? Which animal is it? What do they eat? How about vehicles? Which vehicles do you see? What are the emergency vehicles? Are they allowed to go fast on the roads? Can you make the sound of the siren on a fire truck? We use a French version of Scrabble Junior. At the moment, my son can only spell his name but we’re able to play this game by adapting it for his level. On one side of the board are illustrations next to the written words, like a crossword puzzle for children. We pick letter tiles, name the letters, and put them together to form the words. He also enjoys this because he can identify the words without reading them, just by saying the name of the illustration. I also ask him to say a word that starts with each letter we pick. Before, when he got tired of this, he wanted to name a dinosaur starting with each letter of the alphabet! Scrabble Junior is a great game to help children understand how letters are linked to form words and begin teaching them sounds by putting two letters together. This is a terrific board game that we ordered from the U.S. Players need to make three trips around the board and pick up as many passengers as possible in your taxi, bus, and limousine. You roll two dice, with one telling you how far you can move forward and the other meaning how many passengers will get on or off your vehicle depending on the plus or minus box where you landed. You can count the dots on the dice, try adding and subtracting, and talk about the many things in the town, like the locations and the different passengers. You can buy these, but making your own is easy and laminating them will make them more durable. Your bingo cards could be on a single topic or a variety of topics. This is a good game for reviewing vocabulary the child has learned and it’s good fun when played in small groups. Depending on the age and attention span of your children, you might want to start with a smaller Bingo grid, then make larger ones as they get older. We love construction games. Let the child decide what to build and ask if he wants your help. 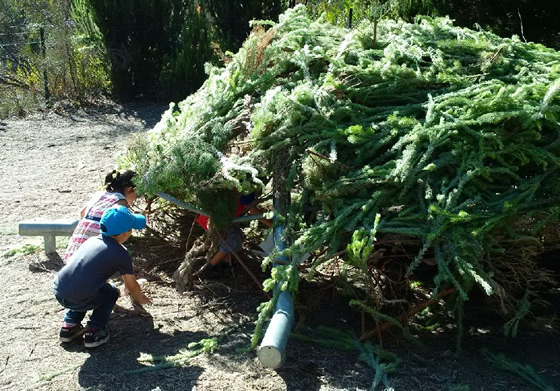 We’ve built dragons and their dens, towers, castles, dinosaurs, forests for our plant-eating dinosaurs, robots, houses, and many more creations. Blocks are versatile and let your child’s imagination do the work. Ask children to describe what they’re doing and maybe make up a story, too, so you can both enjoy your creations a bit longer. My children have recently discovered the amazing world of Playmobil and now have four sets with dinosaurs. This is a wonderful tool for nurturing imagination and storytelling. While working on their fine motor skills, they also change the displays each time to suit their story. This is a fun game, though when we first played it, my son tried to land on the snake’s head even after I explained the rules! After a while he loses focus so, to end the game more quickly, he has to answer a question in Spanish each time he lands on a snake’s head. This is a useful trick because children are often quite competitive and they don’t like to lose. Tiago and a friend play Snakes and Ladders in Spanish. During the week we do at least a couple of craft activities. Once a week we go to the library for story time (in English) and my kids do crafts afterward. And each Saturday I take my son to my language workshops for kids where we also do crafts to reinforce what we’ve learned during the session. Crafts encourage children to ask for tools and materials, and describe what they’re making and their final work. This game is my little learners’ favorite. The last two terms, as the weather warmed up, we held our language workshops in parks. The parents and kids loved it. We would sing songs, learn vocabulary on the topic of the day, and then the children would have a short break at the playground. They would come back ready to focus again on an activity related to the topic we studied and for a craft activity. We were lucky to organize a few “I Spy” games. We went to the museum, to playgrounds with pirate ships and volcanoes, and to a place called Naturescape, which is a park with a spring, a lookout, huts that children have to build, and many things to climb on and explore. I gave them a mission—a laminated sheet with pictures and a short comment in Spanish and English—and they had to find all the items and tell me “I see [the name of what they found]”. They really loved it. 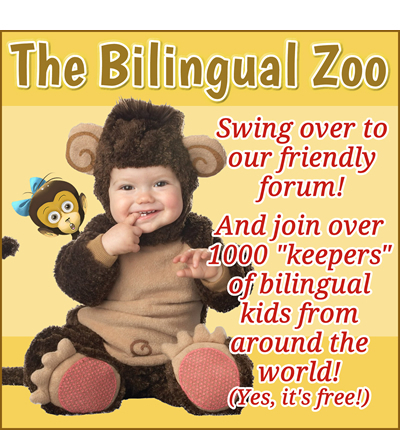 It’s a fun way to learn the language and the children can stay focused for the full hour. Tiago and a friend find the hut on their “I Spy” list. Sometimes the simplest activities are the ones that will amuse your children the longest. A simple cardboard box can become a boat to navigate the Amazon, a castle, a car, etc. Personally, I like activities or tools that are versatile, that leave room for the imagination. I’ve adapted this game for my language workshops and since the children are able to run around, you can guess that it’s also one of their favorites. The children sit in a circle, with one child standing, and that child goes around the circle saying “Boca, boca, ojo” (mouth, mouth, eye). The words are based on the topic of that day’s lesson. 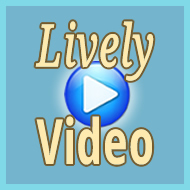 Anything can be used, like the days of the week, numbers, colors, parts of the body, verbs, etc. The child that’s standing gently touches the head of another child, saying “boca,” then moves to another child, repeating “boca,” and finally touches a third child and says “ojo.” That third child then has to chase the first child, who tries to sit at the spot left open by the third child. Children aren’t penalized for being too slow. They all take turns walking around the circle and saying the words. You can make these or buy them. If you decide to purchase a set, perhaps choose one with a variety of themes, such as the house, animals, toys, food, etc., rather than a whole set with animals, for example. Using flashcards with numbers, we displayed the cards on the floor from 0 to 10 and my son first read the numbers on each card. I then used blocks and asked my son to place the corresponding number of blocks under each card: no blocks under zero, one block under 1, two blocks under 2, etc. This helped him understand the concept of the numbers, as well as testing his memory skills and his language ability. In this way, he has learned to count in French, Spanish, and English. Of course, there are many more games and activities that can be used to promote the target language. 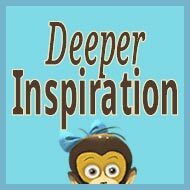 I hope the few that I’ve described in this post might help motivate you to have some playful and productive fun with your kids! How about you? 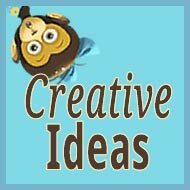 What are some of your children’s favorite games and activities? Please tell us by adding a comment below! 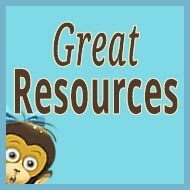 Get more ideas for promoting the target language with small children in the Toddlers and Preschool categories! Wonderful article! 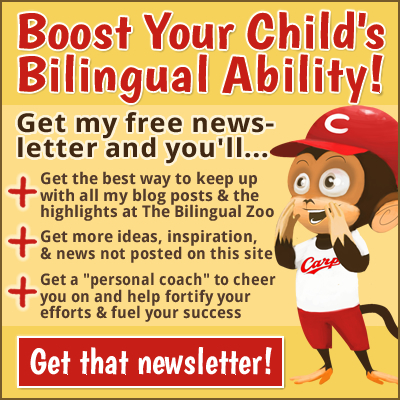 Yes, having fun is at the very core of motivating your children to speak your language. And it’s great parenting all around. Win – win – win! Thank you for your comment. It is definitely more fun than watching TV and we get to spend quality time together. We are building wonderful memories together. Thanks for sharing these ideas! Bananagrams has replaced Scrabble in our house, we can play in either English or French (by removing some of the less frequently used tiles). There are so many different games you can play, or simply use it for spelling challenges – it’s also brilliantly portable, which makes it handy for travelling! Hello memophonics, there are so many more games, you are right and it does not matter how old children are. We just use more complex and fun games. We currently play a game with my 4 year old that he loves. It is a guessing game, i.e. I start “I am a mama, I am a carnivore, and live in the Amazon…” I keep giving clues until he finds what animal it is. He is very good and at the same time he manipulates words such as carnivore, herbivore, omnivore… He sometimes comes up with animals that exist but are not obvious so I don’t guess too quickly! Thanks for the ideas! 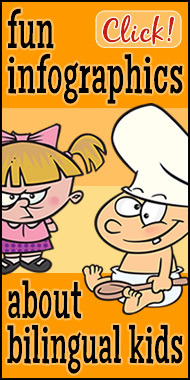 A game that I am using at the moment with my twin girls (3 and a half) is “Guess Who?”. The modern version, which you can buy, now has character cards that you can exchange, or as we have done, make your own. We now have a Disney Princess one and it provokes all sorts of good questions, “Does your princess have blue eyes?”… etc. We are planning to make more cards with animals or even buildings (like princess castles! ).